Several people have asked about the screencast setup that I use for Pluralsight and YouTube: software, hardware, process. Just so I don't have to write the same email again, I'm going to put everything here. I've been using the same tools for the last 6 months or so, so I've had a chance to "dial in" what works for me. Let's take a look at what I do and the tools I use. I'm not getting any kick-backs from the product vendors, and I'll provide Amazon links for the hardware just because it's easy (no kick-backs from Amazon, either). We'll start by looking at the software that I use and what I like about it. For screen capture, I use Camtasia Recorder 8 (which is part of Camtasia Studio from TechSmith). They have both a Windows and a Mac version. I use the Windows version, so I'll only speak to that. Camtasia Recorder for screen capture and Camtasia Studio for editing go hand-in-hand. The features that are available in Recorder wouldn't be very useful to other video editing applications. You can see that there are options to determine which parts of the screen you will capture as well as whether you're capturing the webcam and audio. In addition, the audio options allow you to capture system sounds (or not), and the cursor is captured separately so that you can edit it later. All very useful. I haven't used the webcam recording in a released video (yet). You can thank me later for not having to look at me. 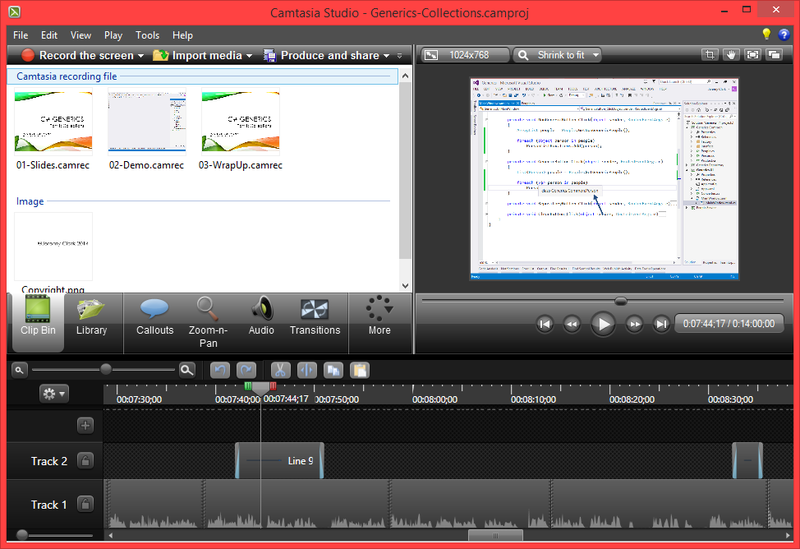 As mentioned above, I use Camtasia Studio for editing. My needs are pretty simple, so I haven't found that I really wanted something that wasn't there (other than "automatically fix the audio" which I'll talk about below). I won't go over all the features of Camtasia; you can learn about that from the website. But there are a few things that I really like and I use frequently. I don't generally do too much with the cursor. Primarily, I uncheck the "Mouse cursor visible" option during the slide portions of my videos. I really like that I don't have to think about this during recording, and I can easily fix it during editing. You can also add "click" effects so that there is a visual change when the mouse is clicked. I don't generally use these, but I see how it could be very useful in a product tutorial where you're showing someone how to use an application. I don't use the processing options (like the volume leveling or noise removal); I don't really have the problems that these options solve. But I do use the "Silence" button quite a bit as well as the "Volume down" button. I'll talk more about these when I go through the production process. I frequently use the "Spotlight" option (which is shown here). And I also use the arrows quite a bit. These are really useful for drawing the viewer's eye to just the right thing on the screen. I've also done a bit of animation with the arrows (to move an arrow around the screen to point to different things). But I usually don't get too complex with my video effects. 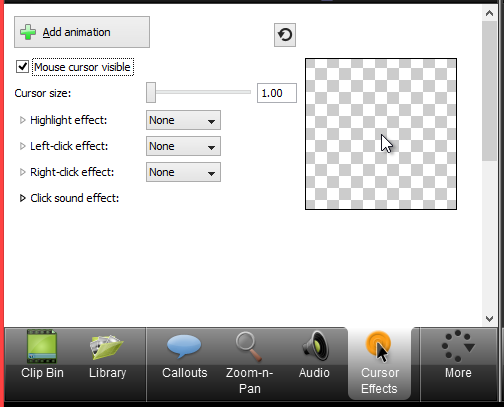 And there are lots of other features available as well, including zooming, scene transitions, and narration. Camtasia also offers quite a few options when rendering video. You can render to various formats, different bitrates and resolutions, and you can also add a watermark to the video during the rendering process (this is how I get the Pluralsight logo in the bottom right corner of those videos). Camtasia will also let you do batch rendering of multiple projects. This is really good for something like Pluralsight where I usually have 7 to 10 separate clips that make up a module. As you can see, things are pretty simple. 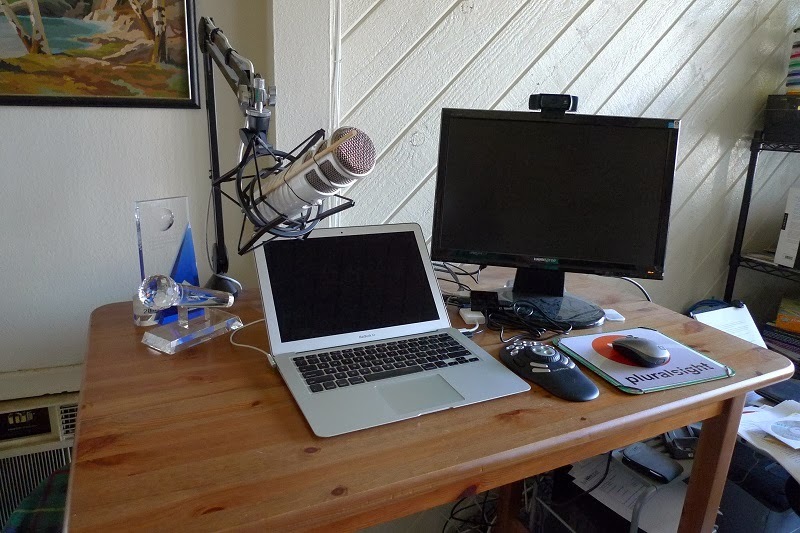 The piece of hardware that makes the biggest difference to the quality of the screencast is the microphone. Now you might say that I should have used a headset mic instead of the built-in laptop mic, but it turned out that the mic built in to my MacBook Air was actually better quality that the Logitech headset that I had. Either way, the Podcaster is way ahead of the other options. 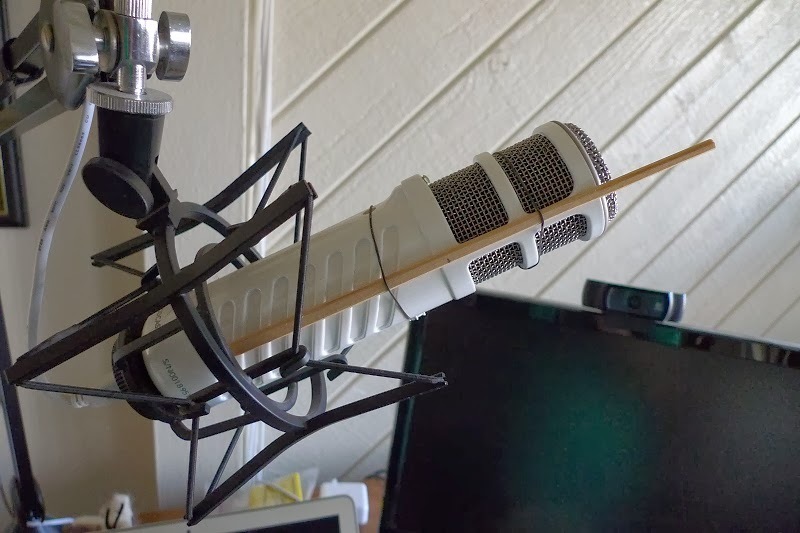 I also know a lot of screencasters who use the Blue Yeti (Amazon link) and are happy with the results. Again, you'll probably also want a swing arm (for convenience) and a shock mount to isolate the microphone from vibrations from the keyboard. You may also want a pop filter (the Podcaster has an integrated pop filter which works pretty well). The microphone is attached to a table that is 40 inches tall. This is a good height for me. And because the microphone is mounted on a swing arm, I have the option of recording standing up or sitting down (on a barstool). Being able to change positions is especially welcome when doing all-day recording sessions. The swing arm is also good because I can simply move the microphone out of the way when it comes time to edit. With my setup, I can move the microphone so that it sits behind the monitor. My newest piece of hardware is a shuttle control. I have the ShuttlePRO V.2 from Contour Design (Amazon link). I've only used this on one video so far (C# Generics Part 1), but this has made a *huge* difference. One of my biggest frustrations in editing was getting exactly the right frame (especially when trying to adjust audio or edit portions of video). The mouse is too fiddly, and the keyboard behaves inconsistently depending on what has focus. The shuttle control eliminates that frustration. I picked this one based on a blog entry from Scott Hanselman (Human Computer Interaction Diversity - 7 Devices that AREN'T a mouse and keyboard). He points out that Tod created a Camtasia profile for this device (Camtasia Studio and the ShuttlePro V2). I'm sure that I'll be customizing the buttons for the things that work for me, but I've found these settings to be a really good starting point. This stuff plugs into a 13" MacBook Air that's a couple years old (i7-2667M and 4GB RAM). I haven't had any problems with video capture, audio capture, or performance -- no stuttering or other craziness. One big advantage of this laptop is the SSD; I've been told that having an SSD (opposed to a spinning hard drive) makes a huge difference in overall editing and rendering experience. Rendering is acceptable. I generally record and output at 1024x768, and rendering times are about 1 to 1 (meaning 1 minute of video takes about 1 minute to render). The CPUs max out during rendering, so make sure your computer is well-ventilated during this process. Finally, I'll talk about my process. This is what works for me. I have published about 20 hours of finished video over the last 6 months, and I've done a bit of tweaking of my process along the way. Preparing for a video takes a bit of time. This is the "creative" part of the process. And this is where I plan, create slides and put together the demo code. I often get asked about whether I write a script. The answer is, I have a partial script. For the "slide" portion of the videos, I put together a script. I'm pretty good with live presentations, but for some reason, I trip over myself when I'm trying to talk slides during a screencast. So for this portion, I script out what I'm going to say. For the "demo" portion of the videos, I have an outline of the points I want to hit along with any code snippets that I'm going to type. I'm really good at talking coherently while I'm coding (for some strange reason), so I don't need a full script. In addition, a full script would probably be distracting since I couldn't read from the script and type code at the same time. It took me a while to "dial in" the settings for my microphone. I spent a bit of time playing with the recording volume settings and varying my distance from the mic. If it was too high, then I got a lot of background noise. If recording volume was too low, then I had to be really close to the mic to be picked up. I ended up with a setting of 90 and a distance of 2 inches from the microphone. As far as the recording process itself, I will do separate recordings for "slides" and "demos". And for Pluralsight where I may have multiple "slide" clips in a row, I record each clip separately. When I'm recording, I don't stop recording if I make a mistake. I simply take a breath and try the line again. For slides, this isn't too difficult. Sometimes I need to backup a slide or hit the back arrow to reset an animation, but it's pretty easy to keep going. For demos, it gets a little trickier. Since I started with live presentations before I did screencasts, I had a tendency to point to things with the mouse. But with screencasting, I "point" to things during the editing process by adding arrows and callouts. So, I generally try to stay "hands off the mouse" as much as possible during recording. This also makes it easier to do clean edits when I'm fixing mistakes. Now, I'm pretty fortunate: I can talk and type at the same time. So, I record the audio and demo all at once. I do make mistakes (a lot). I'm often backing up to a previous point in the code to try a line again. If you don't let the mistakes frustrate you, it's pretty easy to keep going. That's what editing is for; it doesn't have to be a perfect recording. If you can't talk and type at the same time, you can always add narration later on during the editing process. I know of a couple of screencasters who do this. I spend the bulk of my time in editing. In order to try to streamline the process, I've adapted to making 3 editing passes. The first pass is cutting out all of the mistakes. This step takes a long time as I go through and cut out the "dead air" when I pause to get the right words, and also when I need to cut out the mistakes. I find that I cut out about 30% of the raw footage during this pass. I would love to have a "fix audio" button. Like I said, I spent a bit of time dialing in the settings for my microphone to get the cleanest recording that I can, but I still need to do some audio editing. I don't get any background noise in my setup, but I do have smacking noises that come from my lips and gums. This is generally when I open my mouth to start a phrase. I still haven't figured out what causes this, and I've tried a few different things (wet mouth, dry mouth), and a friend of mine even sent me an interesting link about it: http://filmsound.org/QA/mouthclick.htm. I've learned to see these extraneous noises in the audio waveform, and I can select and silence them pretty easily. I'll also remove breathing sounds, but I don't need to do this very often. After enough experience recording, I find myself turning my head away from the mic if I need to take a big breath. I don't have much of a problem with "pops" (hard "P" or "H" sounds). As mentioned above, the Podcaster has a built-in pop filter, and that works pretty well. I get an occasional "pop", and these are easy to fix by locating the sound (usually just 1 frame) and then clicking the "Volume down" button about 5 times. These are fairly rare in my recordings, though. 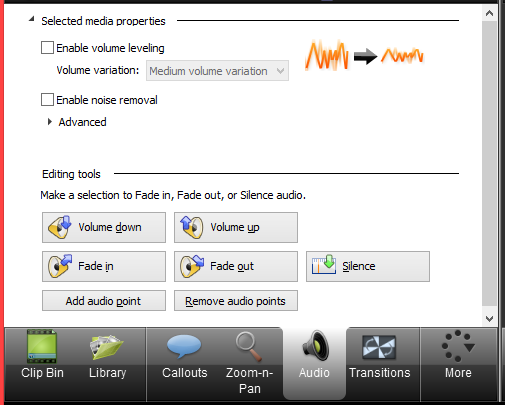 I have tried the noise removal tools in Camtasia, but they don't seem to pick up the noises that I'm concerned about. And if I change the settings so that they do get picked up, then it alters the rest of the audio as well. So for the time being, I'm sticking with the manual process even though it's a bit more work. The reason the "Audio Adjustment" pass is separate from the "Cut To Length" pass is that I found I was spending time fixing audio on segments that I later cut out. That was a waste of time. And I also found that it was easier for me to concentrate on one thing at a time. The last step of the process is adding the video effects. This includes simple things like transitions between "slides" and "demo" and also adding the callouts and animation. This is usually the easiest and fastest editing pass because I generally don't add effects to "slide" portions, and I limit my effects during "demo" portions to highlighting important elements. Rendering is pretty straight-forward. As mentioned above, my laptop renders at about a 1 to 1 ratio. And I have the common rendering settings saved in Camtasia. So, this step is usually just hitting the "Produce and share" button, picking the saved setting, and choosing an output location. Rendering with Camtasia has been rock-solid. But I will give you a warning if you output to WMV files (which I do): Windows Media Player has a problem playing WMVs (yikes!). So, when you're watching the output in Media Player, you may see "smearing" of the cursor or multiple pointers on the screen at the same time. But don't worry, if you view the video with another player (like VLC) or upload it to YouTube, it will look just fine. I've actually been wanting to do screencasts for quite a while. I'm glad that I finally started in earnest last year. I'm hoping to fill up my YouTube channel with lots of good stuff this year (and I'll have some new Pluralsight courses as well). So, now you know how I produce a screencast. These are the things that work for me. Hopefully, you'll be able to use some of these tips in your own productions. Jeremy is an application developer and technical speaker who currently focuses on .NET technologies. He lives with two cats and seedling redwood tree in Southern California.